Jon Hicks proposed it over a year ago and I went ahead and wrote it as a bookmarklet. Finally now, the people who created Safari Tidy (for live xhtml validation), have created a fully integrated Safari Microformats plugin. It's only available for Leopard and I had a little trouble installing, but this was entirely down to the SIMBL install (I had to completely remove the /Library/InputManagers/SIMBL directory before installing SIMBL again - then it worked). It probably marks the death of my bookmarklet in Safari, but to be fair, the bookmarklet was only ever been an intermediate solution before fully integrated Microformats detection and importing was available. Hopefully Apple will consider integrating this kind of functionality directly, since Firefox 3 and IE8 are hinting towards support. 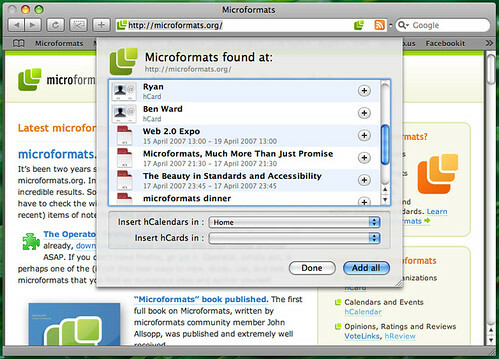 Posted 25-Nov 2007 under leopard & microformats & safari & web.